Seeking Cloud e-mail Solutions for the Corporates is a Complicated Topic. 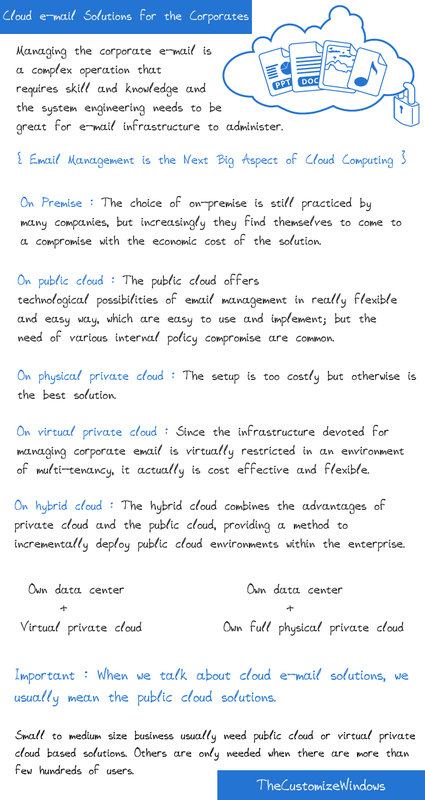 Unlike Hybrid Cloud, Public Cloud solutions is not single-tenant. Setup of self hosted, self server, self managed Cloud e-mail solutions requires a proper team, which is demand of a Corporate and technically, setup of such e-mail servers are one of the most complicated process among the deployment of the common Internet Protocols Suites we use in everyday life, as like we have described in the previous article – Domain Named Emails Explained. Managing the corporate e-mail is a complex operation that requires skill and knowledge and the system engineering needs to be great for email infrastructure to administer. It is easy to understand that the more abundant will be the account numbers and the electronic missives exchanged in a company, the more complicated will be the management of the correct functioning of the electronic mail by the IT departments, hardly ever dedicated solely to business communications. As we have explained before, Email Management is the Next Big Aspect of Cloud Computing. That is said, one can understand that, at the enterprise level all the difficulties management e-mail are more amplified. On the other hand, the need for storage space and data storage increasingly becoming larger and the requirements of safety, quality and regulatory in which many companies are subjected in the past has led companies to adopt server dedicated to handling e-mail, implemented within their own infrastructure or colocation provider are also needed to be considered. This solution is a technological possibilities which still exist for the management of corporate e-mail to which reference is made ? ?in the expression of on-premise infrastructure. May be, we can continue to implement solutions of Exchange or SharePoint, just to mention two products in the industry and also seek the direct control of the hardware, so the software and security of the information contained in the email remains fully safe. The choice of on-premise is still practiced by many companies, but increasingly they find themselves to come to a compromise with the economic cost of the solution which also includes the cost of licensing software products, with the lack of flexibility, difficulty in implementation; with the growth of user needs (material and file shares are becoming more and more full) and, sometimes, with the age of their servers, the economic burden comes in to consideration. On the other hand, there is definitely a ready to use solution for managing the corporate email in much known as the public cloud. The public cloud offers technological possibilities of email management in really flexible and easy way, which are easy to use and implement; but the reduction of complexity (that is tempting especially to business decision makers) does not match the control exercised by the corporate IT infrastructure – be it from point of control on hardware, software and data security in general. Very often this solution counteracts the compliance, which companies have to accustomed, so it becomes an opt-out way. When we talk about cloud e-mail solutions, we usually mean the public cloud solutions, for example in article like List of Good Email Solutions in the Cloud. In the middle between these two extremes, there are three technological possibilities : physical private cloud, virtual private cloud and hybrid cloud. Physical private cloud offers the advantages of public cloud in terms of shared resources, hardware utilization and flexibility of the solution, but remained devoid of the negative aspects of the public cloud. The solution in a single-tenant environment is similar to that on-premise, but the company rather can take charge of the management of the infrastructure in an external data center, which offers enterprise dedicated physical rack connected to the private corporate network through, for example, Point-to-Point VPN. In this way, the company can maintain the direct control over the data and all the infrastructure, while remaining free to implement its own rules of compliance and privacy, separating workloads and infrastructure. The virtual private cloud, however, provides one step higher flexibility compared to the solution just described above, since the infrastructure devoted for managing corporate email is virtually restricted in an environment of multi-tenant cloud. The higher level of abstraction of this technological capability enables the deployment of computational and storage resources very quickly on the basis of operational needs, while maintaining the security in a virtualized environment that lies on an infrastructure designed to support troubleshooting. Finally, there is hybrid cloud. The hybrid cloud combines the advantages of private cloud and the public cloud, providing a method to incrementally deploy public cloud environments within the enterprise. The combination of private / public, allows to respond to many usage scenarios with extreme ease and simplicity. For example, a company has an on-premise licenses and is planning to acquire another business which in reality is not compatible with their own on-premise system. They are not compatible for unification of the services, but through a hybrid cloud solution, without completely eradicating the e-mail system of the company being acquired, unification is possible. Basically, one can think the scenario of a new company with a public cloud solution compatible with the on-premise solution already present with the purchaser. The last options presented to show that it is possible to integrate corporate email server with a cloud infrastructure, to get the benefits of flexibility offered by the cloud without giving up the security, obligations, and to control over the data and the service itself. Similarly, many cloud providers provide corporate e-mail with traditional applications installed on the computers of employees, and they are often also compatible with custom applications. This compatibility is ensured by the provision of fully documented API and therefore can be easily integrated into their systems. This Article Has Been Shared 9230 Times! Cite this article as: Abhishek Ghosh, "Cloud e-mail Solutions for the Corporates : Public and Hybrid Cloud," in The Customize Windows, April 14, 2014, April 19, 2019, https://thecustomizewindows.com/2014/04/cloud-e-mail-solutions-corporates-public-hybrid-cloud/.